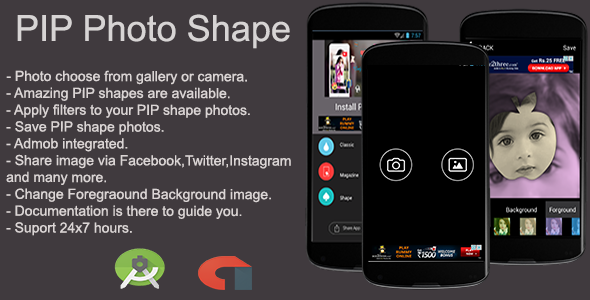 PIP Photo Shape Android App Created by CodeAgent. This templates have specific characteristics, namely: PIP Photo Shape Android App . You can use this PIP Photo Shape Android App on Mobile category for android, application, attractive, code, edit, filters, form, full, photos, pic, pip, shapes, share, source and another uses. • Select photo from gallery or camera. • Amazing different frames are available. • Amazing different color effect filters for foreground, Background Image and both. • Save Image in Folder “PIP Image Final” and it will seem in gallery. • Share image via Facebook,Twitter,Instagram.